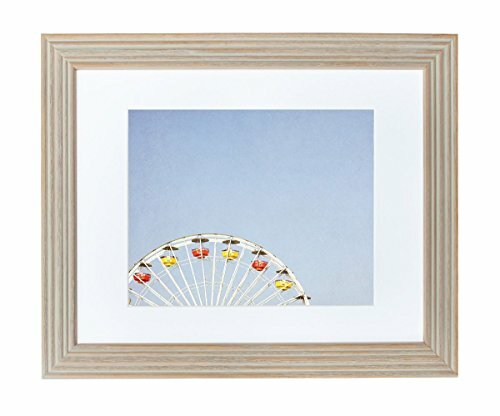 Carnival Art Print presented in a sturdy real pine wood 11x14 frame, made from solid pine with a stylish rustic beach cottage finish, fronted by real glass. Comes ready to hang with pre-installed sawtooth hangers for vertical or horizontal hanging. Includes an acid free, pure white mat board with an 8x10 inch opening to display 8x10 photographic prints or other art. Frame is also perfectly sized to hold a 11x14 picture without the mat, NO trimming of art required! This picture frame is highly giftable, and comes in a sturdy kraft presentation box that protects the bubble wrapped frame in transit and doubles as stylish, hassle-free gift wrapping! TITLE: Framed Ferris Blue8x10 print on archival photographic paper with a non glossy lustre finish. This blue toned carnival art is perfect as a piece of nursery room decor or kid's room wall art. Taken late on a Summer afternoon on the Santa Monica Pier, this image shows the famous ferris wheel, kissing the azure Californian sky.